Today we are announcing the gridARMtm, System on a Chip, with integrated Gigabit Ethernet. The gridARM is targeted at the low cost embedded marketplace where cost and performance are important. The cost for quantity 100 pieces is $10 each. The gridARM is designed for low cost products that require a fast Ethernet connection. As most IT networks, PCs and laptops are all gigabit Ethernet, it only makes sense to have all your devices on the network to be as fast as possible. The gridARM is designed to be the main processor in the system. The cost of adding Ethernet to your product is now low and can be a marketing and performance advantage for your product. The gridARM is available in volume today. The development kit includes an evaluation board, cables, JTAG emulator, power supply and a complete set of development tools including a royalty free real-time operating system, TCP/IP v4/6 library, web server, telnet and example tunneling software. The gridARM is available in two packages – 225 pin BGA and 208 pin QFP. The gridARM chip includes an ARM7TDMI core, 10/100/1000 Ethernet MAC, CAN controller, up to 3 serial ports, I2C, SPI, on chip SRAM, USB device, A/D converters, and interfaces for SDRAM, Flash, Compact Flash, external SRAM, and NAND flash. The gridARM is our third ASIC in the family. The LX and EX ASICs have been around since the early 2000 and are used by thousands of customers in commercial and industrial applications. 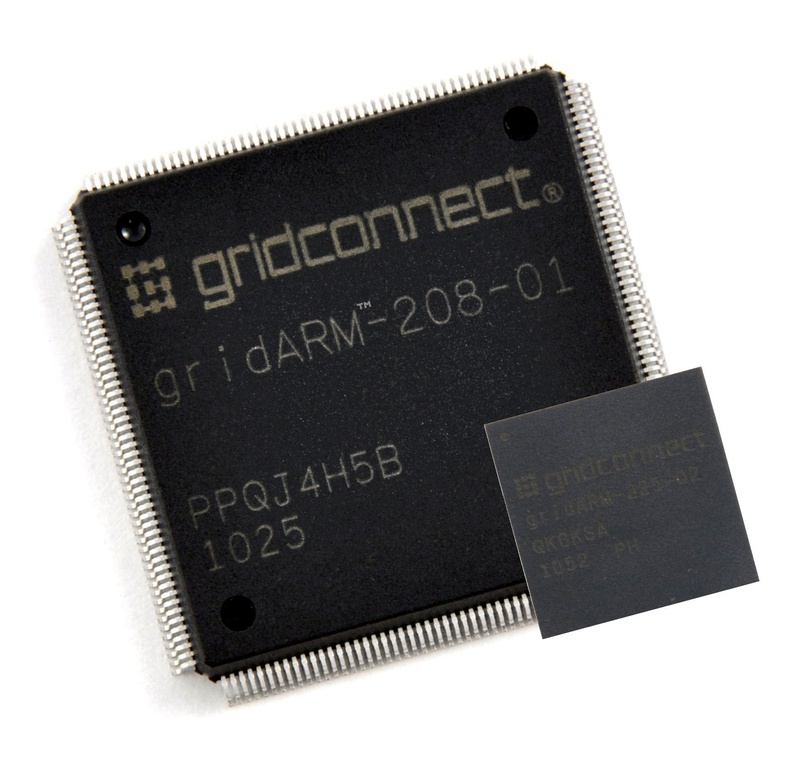 The gridARM is manufactured for Grid Connect by Atmel Corporation.